Cytoplasmic matrix, the soup of life! The deeper we dig the more astonished we are. That is “the cell” the basic functional unit of life. What is life? The question that prevails and wanders in our intellect from the time immemorial and the question remains and our journey into the cell continues. Let us move directly into the topic to find out where we are now? Cytoplasm is everything inside the cell excluding nucleus. Cytosol or cytoplasmic matrix is the liquid, soluble portion of the cytoplasm where cell organelles float. The cytoplasm is a thick solution that fills each cell and is enclosed by the cell membrane. 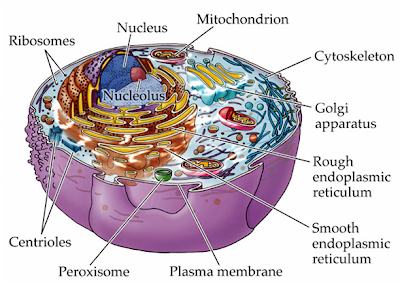 All of the organelles in eukaryotic cells, such as the nucleus, endoplasmic reticulum, and mitochondria, are located in the cytoplasm. The portion of the cytoplasm that is not contained in the organelles is called the cytosol. Although cytoplasm may appear to have no form or structure, it is actually highly organized. A framework of protein scaffolds called the cytoskeleton provides the cytoplasm and the cell with their structure. Why we call protoplasm as living? What is it actually that contributes life to the protoplasm. Let us check it out. The fluid matrix contains basically water, with a major share of 65-80% depending on the cell types, then proteins, nucleic acids, fats, carbohydrates, vitamins, minerals, waste metabolites, pigments, hormones etc. All these substances mentioned above are simply chemicals and are non-living. Do these compounds possess life outside? Big No… is the answer. The highly complex interaction of these non-living substances under the influence of some force creates a real living world and we call this beautiful interaction and outcome as life. Life, the phenomenon we are able to recognize easily but still unable to define. Cytosol, how it looks like? The cytosol is a colourless or greyish, jelly like colloidal substance. Different workers proposed different theories explaining the physical characteristics of the cytosol. Reticular theory, Granular theory, Alveolar theory, Fibrillar theory etc., out of which, colloidal theory stands out and it was based on electron microscopic observation of the matrix. A colloidal system can be defined as a system which contains a liquid medium in which particles approximately 10-10000 A0 in size are dispersed. Every colloidal system consists of two phases: a continuous or dispersion phase and a discontinuous or dispersed phase. Cytosol consists of macromolecules like proteins (discontinuous phase) dispersed in water (continuous phase). Why protoplasm shows colloidal behaviour? Protoplasm consists of cytoplasm and nucleoplasm. The major macromolecules present in the protoplasm are proteins. Proteins exhibit the properties of perfect colloids. In solutions, proteins are charged ions and repel each other and each protein molecule attracts water molecules around it in definite layers. Like many colloidal systems, cytosol exhibit phase reversal under different physiological conditions of the cell. Normally, macromolecules like proteins, lipids etc (discontinuous phase) are dispersed in water, the continuous phase. This condition is called a sol. But sometimes, due to change in physiological, mechanical or biochemical activities of the cell, a phase reversal can occur, where the macromolecules forms the continuous phase and water in the discontinuous phase. Now the solution becomes semi-solid or called as gel. What are the components in the soup (cytosol)? A cell has 10,000-100000 different kinds of molecules. Half of these are small micro molecules of molecular weight less than hundred. Rest are polymers or macro molecules (MW 104-1012). What are organic and inorganic molecules? Molecules inside the cell can be broadly classified into organic and inorganic molecule. Organic molecules are molecules containing C-atoms. They are found in living or once living things. Why these enormous diversity among living things; a single celled bacterium to trillions (n times) cell made blue whale and really really wonderful creatures all around, why so? This diversity of life forms is due to the property of C atoms amazing polymer forming ability. Each C-atom can form at least 4 covalent bonds (valency=4). Carbon has the ability to form very long chains of interconnecting C-C bonds. This property is called catenation. This property allows carbon to form infinite number of compounds. A large organic molecule contains millions of atoms. Even though there is immense diversity, organic molecules are fragile and easy to destroy than simpler inorganic molecules. All other molecules are inorganic and are essential for life eg: H2O, O2, CO2 etc. Why CO2 is not an organic compound? C atom is present in CO2. Strictly speaking, organic molecules are molecules with both carbon and hydrogen. In CO2, carbon hydrogen bonding is absent. That is why it is considered as an inorganic molecule. Which are the elements of life? ~ 46 elements are present in the cytosol. 24 essential elements (life supporting elements) and rest with specific functions. 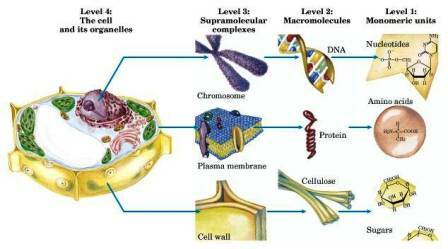 Macromolecules like proteins,carbohydrates, nucleic acids etc are made up of 6 elements. These major elements are Carbon (C=~20%), Hydrogen (H=~10%), Nitrogen (N=~3%), Phosphorous (P=~1.1%), Oxygen (O=~62%) and Sulphur (S=~0.14%). Ca, K, Cl, Na and Mg are essential for life but present in less amounts (major elements). Trace elements like Fe, I,Mo, Co, Mn, Cu, Cr, Si etc are also present and essential for various cellular activities. Ions, what do they do? The acid base balance in the cell is maintained by the ions present in the cytosol. Na+ and Cl- high outside the cell, whereas K+ and Mg+ are seen inside the cell. Free Ca++ ions in blood. Biological fluids, including the cytosol and extracellular fluids such as blood are buffered.The major buffering components in most biological fluids are the phosphate ion (H2PO4-) and the carbonate ion(H2CO3). Cell is a water bag! The most abundant inorganic constituent of the cytosol is the water, the fluid of life. Water accounts nearly 65-80% of matrix. Water in matrix exists in two forms, free water and bound water. Free water occupies 95% of water content in the matrix and serves as the solvent system for all cellular metabolic activities. Macromolecules like proteins can bind to water loosely by H-bonds (bound water) forms the rest 5%. Water % is very low or even absent in seed, enamel and bone. As you grow, your water content in the cell decreases! No need to panic, it’s quite natural any way Drink more water as it is the best medicine…. The percentage of water varies in different cell types and depends on age, habitat and metabolic activities of the organism. Cells of the embryo have 90-95% water which progressively decreases in cells of the adult organism. Cells of higher terrestrial animals have less amount of water compare to cells of lower aquatic animals. The other major macromolecules in the cytosol include proteins, nucleic acids, lipids, carbohydrates etc.